One of the things that I unfortunately had to remove from my diet in January was egg. IgG sensitivity testing showed that I was reacting to both chicken and duck eggs, and given the foods I was reacting to, that made sense. I’ve had problems with eggs before, but not when I was gluten sensitive. This is creating a whole new cooking and baking challenge for me. For my birthday this year, I decided to go for a pie in part because I haven’t done a lot of eggless GFDF baking yet and partially because Whole Foods had organic blueberries on sale for $1.99 a pint last Friday. We had plenty of blueberries left for a pie. 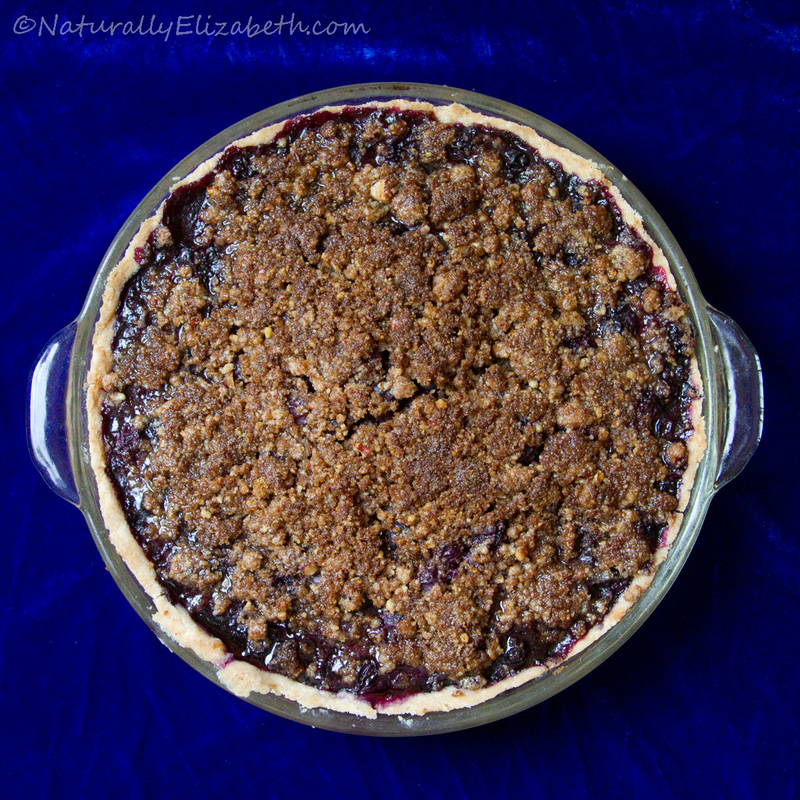 This recipe is based on another GF blueberry pie recipe I had, but the idea of a pecan crumble came into my head while I was standing in the kitchen this morning. It tastes fantastic. I highly recommend it. To make the pecan meal, my daughter ground up a bunch of pecan pieces in a coffee bean grinder that I normally use for grinding flax and other seeds. The meal isn’t perfectly smooth, but it works well for this purpose. To make the crust, stir together the flours, starch, xanthan gum, salt, and cream of tartar. Cut the palm shortening into the flour mix. Slowly add the water to the flour mixture until the dough is formed but a bit crumby. You may not need all the water or you may need more depending on the day. Press the crust into a 9” pie pan. In the same emptied bowl, cut in the shortening into the rest of the crumb topping ingredients. You will get a moist crumbly mixture. Set aside. Mix together the blueberries, lemon juice, lemon zest, cornstarch, and sugar. Pour into the pie crust. Top with the crumb topping. Put the pie on a cookie sheet as it will very likely bubble over while baking. Cover with foil and bake for 45 minutes. 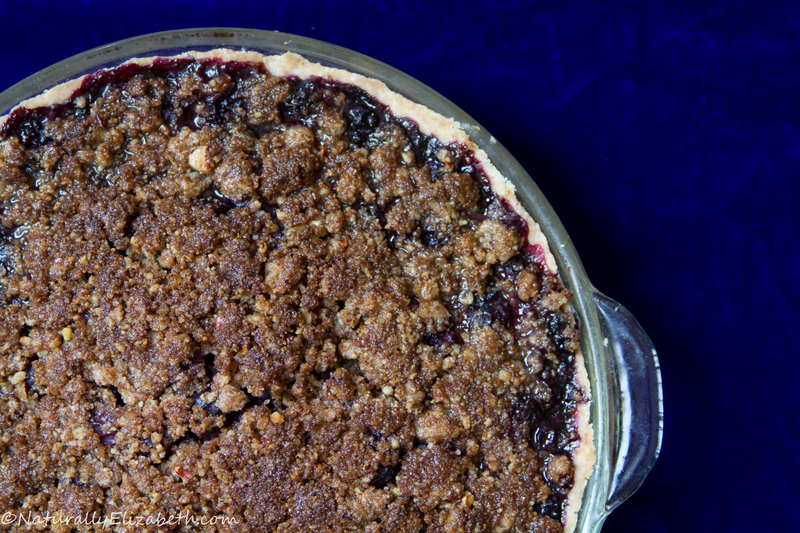 Uncover and continue baking for an additional 20-30 minutes until the crumb topping is browned and the blueberry filling is bubbling. *Use a coffee bean grinder or other grinding machine to make a course flour out of organic pecans.